“The pellet with the poison’s in the flagon with the dragon; the vessel with the pestle has the brew that is true.” said Hubert Hawkins. This fun movie with the goofiness of Danny Kaye in the mix is fantastic! This movie was made during the high time when technicolor was great, and Vista Vision was really going strong. This is one of my favorite Danny Kaye movies. He really was a genius, there were rumors that he was gay, there were rumors that he had problems. The truth is that he was a very good actor and singer. He participated in many films. What is the plot of this great fantasy film? Here you go…Former carnival performer Hubert Hawkins (Danny Kaye) and maid Jean (Glynis Johns) are assigned to protect the infant royal heir from tyrannical King Roderick I (Cecil Parker). 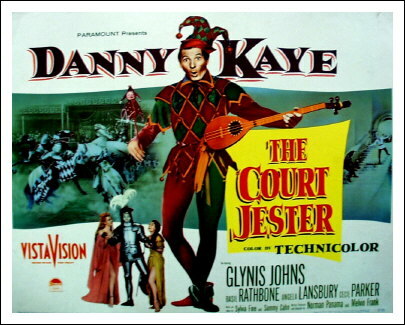 While Jean takes the baby to an abbey, Hawkins gains access to the court by impersonating the king’s jester, unaware that the jester is really an assassin hired by scheming Sir Ravenhurst (Basil Rathbone). When Princess Gwendolyn (Angela Lansbury), falls for Hawkins, a witch secretly aids him in becoming a knight. This had a great cast of people in it, including Angela Lansbury. The film was directed by Melvin Frank and Norman Panama. The score was done by Walter Scharf. It really proves that a movie can be enjoyed even if it is a musical and a comedy. Well that’s all for today. Look forward to my post Thursday dealing with North and South. Happy Listening! Next Next post: North and South not “North and South” Hmm?